I was hesitant to share this spot on my site. It's a tourist destination during the day, but I didn't want to give away my secret hideaway where I go when I want a quiet late night walk. The bridge was constructed only within the year; you can still smell the fresh wood of the balau planks as you walk across. And at night, there's a cool breeze that seeps through the cracks. It's my favorite place to zen out. I was there again the other night after a two hour walk with the dog. There was a lightning storm flashing in the distance, and I was lucky enough to catch one or two shots of it. Beautiful. My best midnight walking buddy. 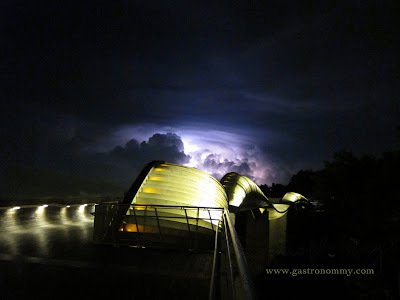 Connects Mount Faber Park to Telok Blangah Hill Park, Singapore's highest pedestrian bridge and ranked one of the most beautiful bridges in the world. ...and who said the now half-retired PAP who commission these things had no taste, eh.